2019 is a critical year to examine the future of community banks. Community banks enjoyed margin expansion in 2018 with deposit costs repricing more slowly than loan yields. But that is poised to change in 2019, threatening margin expansion and earnings. On the asset side, credit costs remain low, but that’s likely to change as well, as the next economic downturn nears. Don’t miss this essential community banking industry conference, focused on the future of community banks and current issues facing community banks. Community bank executives today need to manage bank balance sheets effectively in the rising rate environment, while also preparing for the next credit cycle. But community banks face an even greater challenge: how to stay relevant in a world of rapidly changing customer preferences. What does community banking in 2025 look like? How can community bank executives invest in the future now, and what investments should they prioritize? At this year's 8th Annual Community Bankers Conference, we will discuss the here and now, focusing on deposit strategies, optimizing the performance of banks’ core business and preparing for the next downturn. We will then challenge community bank executives to think about the future, how banks can remain an integral part of the US economy over the next decade and how that should inform strategic planning today. In panels, networking events, and one-on-one conversations, we will discuss what it takes to lead a high-performing community bank now and in the future, and ensure community bank executives walk away with solutions for today and vision for tomorrow. Discuss strategy, optimization, and performance while networking with other community bank executives. Celebrate the Top 100 Community Bank winners and learn from the best. S&P Global Market Intelligence offers unparalleled content from the industry’s leading experts, including an exclusive chance to hear from executives of high-performing community banks, including those in the Top 100 Community Banks ranked by S&P Global Market Intelligence. Curt A. Christianssen joined Pacific Mercantile Bancorp and the Bank as Chief Financial Officer effective January 1, 2015, a role in which he had served on an interim basis since December, 2013. He also serves as Executive Vice President and Chief Financial Officer of the Carpenter Community BancFund, a private equity-funded bank holding company, CCFW, Inc. d/b/a Carpenter & Company, a bank consulting firm, and Seapower Carpenter Capital, Inc., a broker/dealer subsidiary of CCFW. Prior to beginning in the interim role, Mr. Christianssen served in a similar interim role at Manhattan Bancorp and the Bank of Manhattan since 2012. He has served as Executive Vice President and Chief Financial Officer of the Carpenter Community BancFund since 1999. From 1996 to 1999, Mr. Christianssen served as Chief Financial Officer and Director of Corporate Development for Dartmouth Capital Group and Eldorado Bancshares, Inc. From 1993 until its acquisition in 1996 by Eldorado Bancshares, Mr. Christianssen served as Chief Financial Officer of Liberty National Bank. Mr. Christianssen had previously served as Chief Financial Officer of Olympic National Bank from 1991 to 1993, as Chief Financial Officer of two financial institutions under the control of the Resolution Trust Corporation and as a Senior Management Consultant with the Ernst & Young firm. In addition, Mr. Christianssen served in a variety of financial positions with Continental Ministries and Colorado National Bancshares. Mr. Christianssen earned his Master of Business Administration degree from California State University at Northridge and a Bachelor of Science degree from the School of Business at the University of Colorado at Boulder. He is a life-time member of the Institute of Business Appraisers (IBA) through which he holds the designation of Certified Business Appraiser (CBA), and is a member of the National Association of Certified Valuation Analysts (NACVA) through which he holds the designation of Accredited Valuation Analyst. Curtis began his banking career at First State Bank of Morton, Texas (the predecessor institution to City Bank), in 1979 and became Chairman of the Board in 1984. City Bank, now headquartered in Lubbock, has offices in 17 Texas cities from Springlake to Beaumont and from El Paso to Forney plus a location in Ruidoso, New Mexico. It has over $2.5 billion in assets and has been included in American Banker’s list of Best Banks to Work for five consecutive years. The Griffith family has been farming in the Lubbock area since 1924, and in the cotton ginning business since 1945, eventually owning all or part of four gins and with farmland in five Texas counties and New Mexico. The cotton gins were combined into Southwest Gin of Texas in 1992, with Curtis serving as president and general manager. He remains active in farming and cotton ginning, and is also the chairman of Module Truck Systems, which manufactures and services cotton module trucks. Fawn Sachleben has been with Citizens Bank of Edmond since April 2016 where she serves as Chief Lending Officer. Fawn is responsible for the loan growth and credit quality of the bank’s commercial and consumer loans. In addition, Fawn oversees Treasury Management Services and Residential Mortgage Lending. Previously, Fawn was Senior Vice President of Commercial Lending for Bank SNB and VP of Private Banking at Bank of Oklahoma. Before beginning her career in banking as Senior Credit Analyst at Washington Trust Bank in Spokane, WA, Fawn taught Finance and Management classes for Embry Riddle Aeronautical University and was a Financial Analyst in the private sector. Mrs. Crocker has been with the Bank since its origin and serves as Executive Vice President and Chief Operating Officer. She is responsible for directing the implementation of all strategic initiatives and overseeing retail banking, marketing, daily operations, technology and human resources. Prior to joining Bridgewater Bank in 2005, Mrs. Crocker held positions with Commerce Bank in Edina and began her financial career in brokerage at the Montreal Stock Exchange. Mrs. Crocker has over 20 years of experience in the financial services industry. She led the integration of the acquisition of First National Bank of the Lakes in 2016 and chairs the Bank’s IT Steering Committee. Trey Maust, co-founder of Lewis & Clark Bank, brings over twenty years of experience in banking, capital markets and financial services. Prior to his role as Executive Vice Chairman, he was the Bank’s Co-President & CEO and prior to that, the Chief Financial Officer of Lewis & Clark Bank. He previously served as the CFO of another Portland-area community bank. Trey began his career at Deloitte in Portland, where he conducted financial statement audits, internal control assessments, and FDICIA attestation engagements. He later transferred to Deloitte’s Merger & Acquisition Services Group in New York, where he was a resource nationally for bank acquisitions, conducting financial and operational due diligence on transactions in a variety of industries for both financial sponsors and strategic buyers. Trey was also involved in domestic and international acquisitions for Honeywell International. After experiencing 9/11 in person while working in downtown Manhattan, Trey’s commitment to developing quality relationships has defined both his personal and professional life. He is inspired to model these and other core values for his two sons, and exceed expectations daily at Lewis & Clark Bank, a company he helped take from concept to reality. Trey is heavily involved in state and national banking associations, and serves on multiple advisory and fiduciary boards of both for-profit and nonprofit organizations, including: Chairman of Synergy by Association, Inc.; Chairman of the American Bankers Association's Community Bankers Council; advisory board member of the Conference of State Bank Supervisors; board member of the Oregon Bankers Association; board member of the Community Banks of Oregon; board member of Sheltered Harbor; advisory board member of StoneCastle Partners; advisory board member of Anvil Media; and past board member of Entrepreneurs’ Organization(Portland). Check out the 2018 highlight video to get a taste of what the Community Bankers Conference is all about. Each year the Community Bankers Conference we recognize winners from the S&P Global Market Intelligence Annual Community Bank rankings. Access presentations about some of the industry’s hottest topics from the 2018 Community Bankers Conference. As a prelude to the program, attendees are invited to arrive early on Monday, April 8, to participate in the pre-conference golf tournament. This 18-hole, par-70 course was home to the AT&T Byron Nelson PGA Tournament for many years. The first 20 bankers to register for golf can play for free. For all others, a separate fee of $250/person, payable at the time of registration, covers your cart and green fees (rental clubs are available from the resort for an additional charge). Box lunches will be provided and groupings and tee times will be communicated closer to the event. All conference registrants are invited to attend. Executives from top-ranked banks in the S&P Global Market Intelligence 2018 Bank Rankings will be invited to enjoy fantastic cuisine while engaging in intimate discussions with other top-performing banks. Attendees will be encouraged to share strategies that have helped them achieve top performance, giving you valuable insights from your peers. The 2018 Top 100 Bank Rankings will be announced in March. In this session, Nathan Stovall, Senior Research Analyst at S&P Global Market Intelligence, will lead us through proprietary projections for community bank performance. He will describe the current economic environment for banks and what the data suggest lies in the future. Non-bank competition for deposits, both for consumer and commercial customers; how can banks combat this? Rethinking liquidity and funding – are wholesale and alternative strategies viable? What non-core options will work on your balance sheet? Each year, S&P Global Market Intelligence ranks top performing community banks, the top 100 community banks less than $3B in assets and the top 50 banks $3B to $10B in assets. At the Conference, we recognize and celebrate those banks that made the prestigious annual ranking in 2018. A look at key economic indicators and what this means for the future operating environment for community banks. What signals should banks watch out for to avoid being blindsided by the next recession? Katie Darden, Financial Institutions Research Director at S&P Global Market Intelligence, will describe how digital banking platforms are evolving all over the country, as well as deliver the latest insights into consumer preferences based on the 2019 U.S. Mobile Banking Survey. What experience do your customers want? How does this differ for your commercial and retail customers? How will this continue to change over the next 5-7 years? Technology buzzwords abound from AI, blockchain, Internet of Things and the cloud. What technology do you need to put in place now to prepare for 2025? How will technological advances impact your bank and the customers you serve? What investments do you need to make now? What capabilities do you need in-house? Who is going to lead your bank in 2025? Can becoming a more technology-oriented bank solve your future talent issues? How do we make banking cool again? Interested in speaking? Please email spgmievents@spglobal.com. Additional speakers are confirming their participation. Check back for updates. As a strategic advisor to financial institutions, Ron provides technology guidance, including organizational reviews, spend analysis and business process optimization ideas. Ron has in-depth industry knowledge in financial services. Dr. Breeden has been designing and deploying risk management systems for loan portfolios since 1996. He founded Prescient Models in 2011, which focuses on portfolio and loan-level forecasting solutions for pricing, account management, CCAR, and CECL. He is also the owner of auctionforecast.com, which predicts the values of fine wines using a proprietary database with over 2 million auction prices. He is member of the board of directors of Upgrade, a San Francisco-based FinTech,, an Associate Editor for the Journal of Risk Model Validation and for the Journal of Credit Risk., and a founding board member of the Model Risk Management International Association (mrmia.org). Michael is Founder and CEO of Nest Egg, a Robo Advisor platform purpose built for Regional and Community Banks. Nest Egg is a registered investment advisor and its wholly owned subsidiary is a FINRA Member Broker Dealer. In addition, Michael is Founder and CEO of Addison Capital. Addison Capital is a registered investment advisor headquartered in Philadelphia, PA. Michael founded Addison Capital in 2009. Michael was previously a Five Star Morningstar rated mutual fund manager. Mr. Friedman founded FJ Capital Management LLC in 2007 and is the portfolio manager for the flagship Financial Opportunity Fund; an event-driven strategy focused on the U.S. community and regional bank sector. Mr. Friedman established the Financial Opportunity Fund and has successfully navigated the fund, creating substantial alpha since inception. He also created in the Spring of 2015, the Financial Opportunity Long/Short Fund, a lower net, broader financial services fund with lower market volatility and beta. He is currently a member of the Board of Directors of Reston, VA-based commercial bank Access National (ANCX) since 2009, and Denver, CO-based TIG Bancorp since December 2017. February 2018, Mr. Friedman was appointed Board observer for Silvergate Bank in San Diego, CA. In 2013, as part of the recapitalization of Anchor Bank, Madison Wisconsin; Mr. Friedman was elected to the Board of Directors where he served on the Board of the bank holding company and compensation committee. Mr. Friedman served on the Board of Directors of Guaranty Savings Bank in Metairie, Louisiana from 2008 to 2009. Mr. Friedman brings over 30 years of experience in and around the commercial and investment banking industries, in which he applied and developed skills in financial analysis with an expertise in financial institutions, corporate finance, SEC and banking compliance and management. Jason is the founder of the FinTech Forge, a managed service provider helping financial institutions build and extend their innovation capacity, and Alloy Labs, a consortium of banks working together to adopt technology and drive innovation. He is also the co-host of Breaking Banks, the world’s largest fintech podcast, and Chairman of FinTEx, a non-profit growing the FinTech cluster across the Midwest. Jason is a frequent speaker on financial innovation, regulation, compliance as competitive advantage, the importance of diversity and the potential for technology to drive financial inclusion. He is on the FinTech advisory boards for the City of Chicago, the AARP, the Center for Financial Services Innovation Lab, and the SXSW Accelerator. Jason stumbled into financial services in the early 90’s as a manufacturing engineer for Deluxe Corporation. Since leaving paper checks for the digital world, he’s been an entrepreneur, venture capitalist and head of strategy implementation for a public company. In 2008, he co-founded PerkStreet Financial, one of the first challenger banks, helping pave the way for new partnerships between traditional financial service firms and startups. David Howard is President of Digital Streategy & Innovation at OceanFirst Bank where he oversees strategy and implementation of all digital and broadly distributed channels and products of the bank. Prior to this role, he was the bank’s Chief Risk Officer. Prior to joining OceanFirst, Mr. Howard was a Managing Director at Guggenheim Partners in New York, a financial services firm with over $200 billion in assets under management. Among other duties, he was co-founder and Chief Risk Officer of the company’s banking subsidiary, the first de novo bank to achieve investment grade ratings. Previously, Mr. Howard was a Managing Director at General Electric Capital and Chief Risk Officer of their $250 billion insurance subsidiary, FGIC. Mr. Howard began his finance career at Fitch Ratings, where he advanced to head the Consumer Asset Backed Securities Group and then was Managing Director of the Credit Products Group. Mr. Howard received a B.S. in Electrical Engineering from Syracuse University and worked in nuclear and defense engineering for several years before turning to finance. Corey LeBlanc is Chief Digital & Innovation Officer at Origin Bank. Brian joined The Travillian Group in 2016 to lead the recruiting effort focused on Depository Institutions. He leverages the experience gained from ten successful years in client facing roles within the banking industry. As a Banker- and now as a Recruiter- he emphasized impeccable service, laser-focused project management, and effective business development. Brian primarily focuses on strategic talent acquisition with Community Banks from $30B in assets, all the way to more unique initiatives like Denovos and Recapitalizations. He is very passionate about making banking exciting for future generations and is very well-connected to tenured, proven leaders as well as leaders on the rise. Ash Patel serves as President and Chief Executive Officer of Commercial Bank of California. With over 20 years of experience serving in the banking industry, Ash has evolved from a banker with an entrepreneurial drive to a seasoned CEO focused on inspiring his team and clients to achieve their dreams. Ash leads by example and invests in building relationships and cutting-edge technology to enhance the client experience. Ash invests in human capital through the “PJ2B” (Purposeful Journal to a Billion) initiative. This initiative has led to an inspired CBC team, tailored client experience and the successful turnaround of CBC, which is a privately held billion-dollar bank. Under Ash’s leadership CBC has shown significant growth from around $200 million in assets in 2013, to approximately $987 million as of December 31, 2018. This growth was accomplished both organically and through the acquisition in May 2017 of National Bank of California. Ash’s 2018 accomplishments extend beyond mere financial performance, however. In 2018, CBC bolstered a strong management team with four new executives: Market Presidents Claudia Bodan and Mike Helmuth (for our Los Angeles and Orange County markets, respectively), Growth and Strategy EVP Shahzad Khan in the Payments Division, and EVP/Chief Risk Officer Neel Pinge. CBC added three new CBC locations in 2018: new regional offices in Anaheim and downtown Los Angeles, and the Payments Solutions facility in North Hollywood. Lastly, the institution added a fintech component to the CBC corporate family. VeriCheck is a provider of ACH services based in Atlanta, which processes over 900,000 transactions each month for its payment’s clients. Ash and the team at CBC endeavor to build a bank that does not exist today with a focus on offering customers a high touch experience combined with high technology solutions. He has been at the forefront of the critical industry conversations surrounding FinTech and how traditional banking organizations need to evolve to embrace new technology. David C. Sandler is a Principal at Sandler O'Neill + Partners, L.P. He works with the firm’s West Coast clients in all aspects of strategic planning and franchise value enhancement, including asset/liability management, mergers and acquisitions and corporate finance. Mr. Sandler also advises the firm’s private equity clients on capital raising and depository strategy. He is a frequent lecturer at banking graduate schools, trade associations and industry conferences. Chief Executive Officer of Stieven Capital Advisors, L.P., a registered investment advisor focusing on investments in financial institutions (founded 2005). Served on the Financial Accounting Standards Board’s (FASB) Investors Technical Advisory Committee (ITAC) from 2012 through 2015. Senior Vice President & Director of the Financial Institutions Research Group at Stifel, Nicolaus & Company (1985-2005). During his time at Stifel, the firm completed more than 250 transactions for financial institutions. Federal Reserve Bank of St. Louis: Analyst/examiner 1983-1985. Nathan’s primary responsibilities include covering and analyzing financial institutions, with a focus on the banking industry. Nathan regularly writes about emerging balance sheet trends, trends in bank accounting, regulation, interest rate risk, capital actions and M&A activity in banking. He is the author of a monthly column focused on banking in the South and the banking blog, StreetTalk. His in-depth analysis of the banking industry, including a focus on smaller institutions, can be found on SNL’s Research & Analysis feature, which includes historical and forward-looking performance figures. During his tenure, he has regularly covered and participated on the conference circuit, moderating panels and webinars focused on major issues facing banks. He has spoken as industry events as well, offering updates on bank fundamentals, market conditions and forecasts for what lies ahead. Dory A. Wiley, CFA, CPA, CVA is President & CEO of Commerce Street Holdings, LLC, the holding company for Commerce Street Capital, LLC ("CSC"), a FINRA-member broker/dealer and Commerce Street Investment Management, LLC ("CSIM"), an SEC-registered investment advisor. Since co-founding the firm in 2007, his primary focus has been the management and growth of the broker dealer and the creation of investment funds that specialize in financial institutions, retirement plans, institutional portfolio management, and related products. Mr. Wiley is frequently quoted in the media, and regularly speaks at universities, conferences and seminars regarding corporate finance portfolio’s and asset allocation, as well as alternative investments. He has also made numerous appearances on Fox Business News and CNBC. He has testified as an expert witness on bank and securities valuations, and written articles for various periodicals. Mr. Wiley serves on the Boards and Investment Committees of multiple investment funds. Those funds have included SBICs (Independent Bankers Capital Fund), Bank Hedge and Private Equity funds (Keefe Managers, Keefe Partners, Keefe Rainbow Partners, Service Equity Partners, Genesis Partners, and Commerce Street Financial Partners) and debt funds (Commerce Street Income Partners I and II). He formerly served as a member of the Board of Trustees of the Teacher Retirement System of Texas ("TRS"), an approximately $30 billion pension fund where he was Chairman of the Investment Committee, Chaired the Alternative Assets Committee and served on Compensation, CIO recruiting, Audit, and Government Committees. During his tenure, TRS went from a bottom quartile performer to the number one ranked public pension fund in the country in its asset size group was the 5th largest public pension plan in the country. Mr. Wiley has over 25 years of experience in commercial and investment banking and investment management. Prior to his current position with Commerce Street, Mr. Wiley was President of SAMCO Capital Markets, LLC, which he joined in August, 1996. Prior to SAMCO, he was Vice President and Manager of the Financial Institutions Group at Rauscher Pierce Refsnes, now RBC Capital Markets. Mr. Wiley has also been an advisory board member to numerous small banks throughout the country. He is a member of the AICPA, Texas Society of CPAs, the Dallas Society of Financial Analysts, the National Association of Certified Valuation Analysts, and the CFA Institute. He holds series 24, 7, 63, 66 and 65 securities licenses, and is currently serving on a FINRA regulatory committee. He is a member of the National Association of Corporate Directors and also serves or has served on several charitable boards/advisory boards including the Liberty Institute, the Cotton Bowl Committee, Texas Tech Red Raider Club, the Texas Tech Rawls School of Business, the Texas Tech Foundation Board, the Baylor Health Care Systems Foundation, the SMU Cox School of Business Mentor Board, the University of North Texas Library Board, the Dallas Health and Human Services Commission, and the Park Conservancy Board. Stephen Wooters is 20+ year financial services veteran with a wide range of experiences with global, national, and community banks across retail and commercial banking. Steve’s celebrated career includes numerous payments and digital banking firsts – helping to launch things that are today common place in the industry. A member of the executive team at Fairfield County Bank, Steve is EVP, CMO and Head of Digital Banking & Payments. In his role, Steve provides leadership in developing and executing FCB’s marketing & digital agendas, ATM fleet, payment card programs, and cash management businesses – helping build primary bank relationships with the community bank’s very valuable customer base. Steve and his family recently returned home to the United States from Toronto where he led a $55B annual purchase volume business as the Head of North American Retail Payments for the Bank of Montreal. Prior to BMO, Steve was with the Royal Bank of Scotland where he led various businesses including US Retail Payments, Global Transaction Services Marketing, US Commercial Cards, and Small Business Lending. Steve started his career in product development and marketing for credit card giants MBNA and Bank One/First USA. Your registration fee includes continental breakfasts, lunches, all refreshment breaks as well as cocktail receptions. Current clients include any firm that currently subscribes to products/services offered by S&P Global Market Intelligence, excluding other conferences and training classes. The standard rate applies to attendees who are not bank officers or bank directors of an FDIC-insured financial institution, such as board advisors/observers, investment bankers, correspondent and wholesale bankers (even if part of an FDIC-Insured Financial Institution), attorneys, accounting firms, and other vendors and service providers. S&P Global reserves the right to verify your company profile and adjust your registration rate, if necessary. SPGMI, its affiliates, and third-party providers offer these programs with the understanding that SPGMI is not providing any professional advice and assumes no liability whatsoever in connection with the use of its materials. SPGMI reserves the right to (i) make portions of the program registration information available to program sponsors; and (ii) to cancel or change programs, content, speakers or venues at any time. Full payment must be received by SPGMI prior to the start of the program. Attendee substitutions from the same company may be made at any time; however, SPGMI reserves the right to decline registrants at any time for any reason. SPGMI offers a tiered cancellation plan. These Refund Terms set forth the conditions for when you may be eligible to receive a refund, which generally is the program fee less an administrative fee. SPGMI will not be held liable for any costs incurred by registrant due to individual registration cancellation. a. Full Refund: In the event that a program is cancelled due to inclement weather, faculty cancellation or force majeure, SPGMI will refund the registrant's tuition in full, however SPGMI will not be liable for incidental or consequential out of pocket expenses incurred by registrants. b. Partial Refund: If you cancel fifteen (15) days or more prior to the start of the program, you will receive a refund of the program fee less a $150 administrative fee. •	No Shows: If you do not attend the program, you are responsible for the full program fee and will not receive a refund. •	Late Cancellation: If you cancel less than five (5) days before the start of the program, you are responsible for the full program fee and will not receive a refund. b. Program Credit: Eligible registrants who cancel after the date in paragraph b, but at least five (5) days prior to the start of the program will receive a credit of the program fee less a $150 administrative fee. This credit may be applied to future programs but registrants will not receive a refund. Spouses are welcome to attend the Welcome Reception and Cocktail Reception. Please contact our support team at globalevents@spglobal.com or call us at 434-951-7786 if you wish to add this to your registration. Activities: As a prelude to the program, attendees are invited to arrive early on Monday, April 8, to participate in the pre-conference golf tournament. This 18-hole, par-70 course was home to the AT&T Byron Nelson PGA Tournament for many years. The first 20 bankers to register for golf can play for free. For all others, a separate fee of $250/person, payable at the time of registration, covers your cart and green fees (rental clubs are available from the resort for an additional charge). Box lunches will be provided and groupings and tee times will be communicated closer to the event. We have negotiated rates at the Four Seasons Resort and Club, Dallas at Las Colinas starting at $295 per night, excluding taxes and fees. This rate is available through March 8, 2019. Upon registering for the conference, you will receive a link to book your room online. Looking to book before or after the conference? Please call the hotel at (972) 717-0700 for rates. The group block rate can be applied to these nights, based on availability at the hotel. Are you a market leader or looking to become one? For information on sponsorship opportunities, please contact Brian Hodges at brian.hodges@spglobal.com or 434-951-7628. 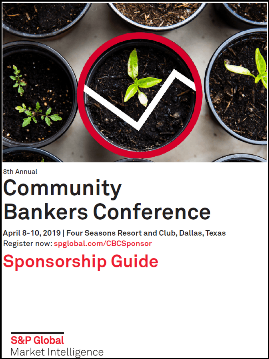 The 8th Annual Community Bankers Conference is the premier forum at which influential opinion leaders, executives, board members, policy makers and Wall Street professionals put forward their visions and views of the strategic issues facing community banks. This unique conference delivers an audience of senior executives and directors of community banks with asset sizes of $100 million to $10 billion. Becoming a sponsor of this executive conference will provide your company face-to-face interactions with executives eager to discuss and debate the most pressing industry issues and their solutions. With our network of leading banking executives in the industry, we afford you the opportunity to have meaningful conversations at networking and entertainment events in a relaxed environment. Your firm’s brand will be placed on our direct mail, email, website and a variety of other branding options at the event. Take advantage of this opportunity to align your business with a leading brand in the community banks industry, S&P Global Market Intelligence. Casual business attire is recommended. Yes, it's straight and simple. We firmly believe in the content value of this program, and we will refund your registration fee in full if, 1) you rate this program a 1 or 2 (on a five point scale) on the evaluation form distributed at the conclusion of the program, 2) you provide specifics on the evaluation form as to the cause of your dissatisfaction, and 3) you agree to talk with us if we call to discuss how we can improve the program going forward. Does this event qualify for CPE credits with NASBA? Participants who complete this program qualify for up to 11 hours of CPE credit (Specialized Knowledge and Applications). Program Level: Intermediate. Delivery Method: Group-Live. The Knowledge Center, S&P Global Market Intelligence is registered with the National Association of State Boards of Accountancy (NASBA), as a sponsor of continuing professional education on the National Registry of CPE Sponsors. State boards of accountancy have final authority on the acceptance of individual courses for CPE credit. Complaints regarding registered sponsors may be submitted to the National Registry of CPE Sponsors through its website: www.nasbaregistry.org.